This is how Aberdeen’s oldest hospital could look if plans are approved to transform the site into a hotel and flats. Award-winning developer Charlie Ferrari has unveiled his vision for the historic Woolmanhill Hospital which dates back to the 18th century. The blueprint includes a 52-bedroom boutique hotel, 27 serviced apartments, 32 residential apartments and 10 affordable flats. A central square also forms part of the development plans. Mr Ferrari’s company CAF Properties (Woolmanhill) Ltd will apply for full planning permission to renovate four buildings on the site. The application will be lodged with NHS Grampian, the current owners of the site, and the hotel and apartments would be owned and operated by Glasgow-based G1 Group (Holdings). A pre-application notice was lodged with NHS Grampian last month and Mr Ferrari believes the scheme would complement the historic area. 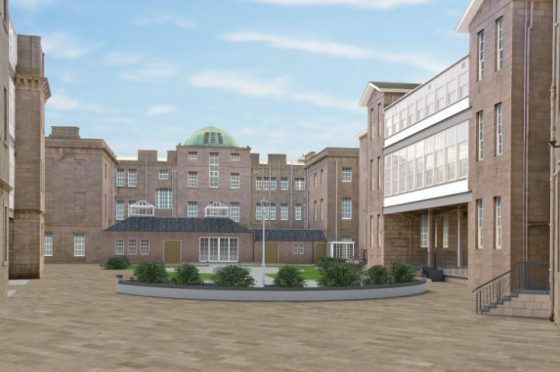 All four main buildings are listed and the hotel project, to be located in the Grade A listed Archibald Simpson building, will form the centrepiece. The developers said the hotel would also provide a venue for weddings and conferences. At the centre of the courtyard, they are proposing “a unique display of a single shaft of white light” with changing colours at night. The proposal would see the east-facing Stephen Building, which looks onto the main Woolmanhill roundabout, include a range of 27 one, two and three-bedroom apartments, to be available on a short to long-term tenancy. The long, west-facing Victoria building would be renovated to become 32 two and three-bedroom apartments and three-bedroom duplexes. Construction of the original Aberdeen Royal Infirmary complex began in 1740 and, latterly, Woolmanhill was used as an out-patient clinic. It was deemNHS Grampian was granted permission to close the facility in 1999. Staff have been leaving the buildings over the last two years, with many relocating to the Aberdeen Community Health and Care Village. Developers hope the redevelopment work could start on the site by mid 2017.